There are so many different traditions surrounding Christmas, Most have their roots in the past and still exist today, despite the modern way of life. It is one of my most enduring images of Christmas – the ancient Irish custom of placing lighted candles in a front windows of the house on Christmas eve. The large lighted candles are placed there after dark, and not extinguished until after midnight. It is such an evocative sight. Lighting the way home, guiding the ‘stranger’ to our doors, reaching out to those on a journey, often a hard and difficult journey, on this very special night. 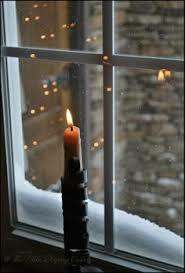 The candles in the windows at Christmas would have been a spectacular sight in the times before electricity. Standing in Skehana looking across at Ryehill with all of the little dots of light would have been magical when outdoor lighting was non existent. It is a symbol of welcome to Joseph and Mary, who, despite their need, were refused shelter in the inn. By this symbol, we offer shelter to them and to their Infant, Jesus. It is a whole countryside opening its doors and its hearts, to a young couple, who could find no place to shelter. As Joseph and Mary were travellers, this light is offered to all travellers – to light their way home in the dark night or to take shelter with us in our homes. The lighted candle signifies commitment on our part to reach out and help banish darkness for friends and strangers alike; it enhances a sense of community, from which nobody is excluded, because we have helped to light the way for them. Driving through the countryside on Christmas eve, often whole hillsides and villages can be picked out by the little sparks of candlelight, these warm and welcoming lights shine out in the darkness and say ‘You are welcome’. We have a lovely Christmas tradition, handed down from ancient times, and still very much alive today ‘The candle in the window’. I really like this idea and thanks to whom ever shared this post for all to see. I forwarded this onto our Local Action Group who has been doing a little research on what we might do estate wise for Christmas as we like to do something different in our estate as a community each year. We never did this before but we are going to try and promote it throughout the neighbourhood this year. 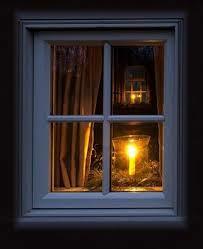 Candles in the windows would be so nice. It’s a beautiful picture of Christmas, a time that I love so well and enjoy each year. I look forward to it’s arrival and love to be part of the hustle and bustle. You have an extremely nice site, I love the design and style and it really stands out.